As well as our standard stool tops, we can also offer you a recover service, or new seating for your bar, club, pub or restaurant. 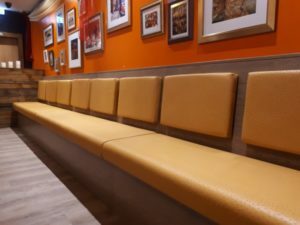 So whether you need a repair, are looking to freshen up your tired interior or refitting new seating please contact us to discuss your requirements. The drawings and specification remain the responsibility of the primary contractors. We do not accept any responsibility for installation of the seating and or correct fitment unless prior agreement in writing. It is the responsibility of the main contractor to inspect and approve before leaving the workshop. Once done so we will not be held responsible for fitment or damage acquired after. It is the responsibility of the main contractor/customer to check suitability of materials and coverings so that they meet current fire regulations. Any changes of specification after manufacturing has started will be chargeable. Any damage or alterations after work is completed will be chargeable this Includes any work carried out on site. We withhold the right to decline working on site unless prior agreement to this it will be chargeable at current hourly rate to include traveling expenses. If in excess of ten hours to include travel time a charge for overnight accommodation will be made. 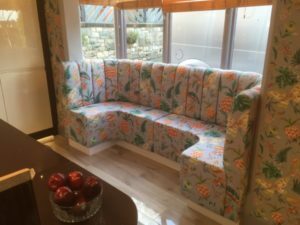 Reasonable time scale for work to be carried out and completed over agreed initial completion date time must be given for any alterations or delays in receiving frames fabrics etc. A deposit of 50% on acceptance of quote before work commences. The balance including any extras are payable on receipt of final invoice. Any late payments will be chargeable at current rates and after 30 days we will act to recover the balance.